The driver of a blue Mercury had his vehicle slam into a parked Chevrolet and the front of West End Discount Tobacco & Beer Convenience Store Friday afternoon. 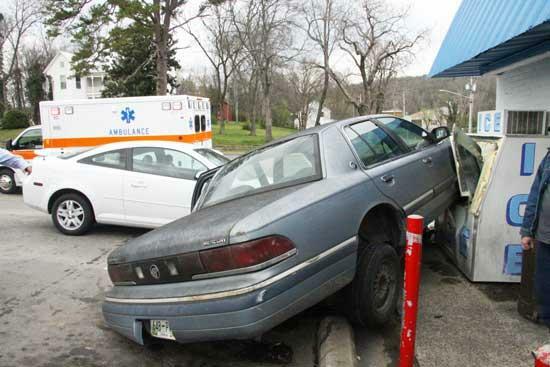 The driver of the Mercury indicated the gas pedal of his vehicle stuck, causing it to speed out of control. No one inside the store was reported to be injured. Some people were trapped inside for a short time, and the smell of gasoline necessitated the calling of the Woodbury Fire Department to the scene. Woodbury Police Chief Tony Burnett and Sgt. John House responded to the accident. Chief Burnett said no charges were filed against the driver. Another good reason to quit smoking.